Are you looking for a free software product that can find and delete duplicate files from computer ? Duplicate Filter can be your best free duplicate file deleter, which can instantly find, compare and delete duplicate files on your computer and neighborhood computers. You can rename, move or delete duplicates after finding duplicate pictures, mp3 music, songs, photos, images, videos, documents and other files. This duplicate file deleter can work with Windows platforms including Windows 7, Windows Vista, and Windows XP. No matter you wish to delete duplicate files from hard drive, a specific folder, or even shared folders on network computers, Duplicate Filter is the best software program to delete duplicate files quickly and easily. The duplicate deleter free download is available on the software download page, you can download and install the software in seconds, and find and delete duplicate files automatically. If you are looking for a software utility to clean up junk files and multiple repeated files to free up your disk space, Duplicate Filter is also a great helper. In addition to deleting duplicate files, this program can also search and delete the largest files that are unneeded. You can find up to 500 largest files in each folder. The software has a permanent freeware version. You can get free download, make free scan, and remove duplicate files to free up disk space. Search for duplicates or similar files by similarity: Cyclic Redundancy Checksum (CRC), CRC+Name (Exact), Name and Size,etc. Free download and free scan! Work with Windows systems including Winows 7, xp, vista. Scan your pc or shared folders on neighbour computers in your network to see if there are any duplicates that are identical or similar to a specific file. You can rename, move and permanently delete your selected duplicate files easily. You can instantly find out a duplicate file in results by inputting part of the file name. 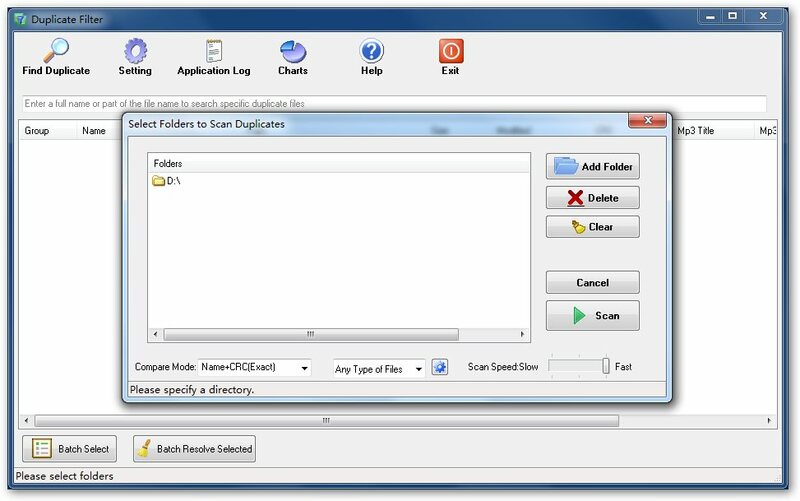 In the free version of this duplicate file remover software, you can delete duplicate files from your computer, which you get results from "Find Duplicates" section. The file duplicate remover software can not only to search and delete duplicate files on pc, but also compare whether two files are identical by using CRC32. Locate the biggest files that occupy your hard disk space, and delete useless large files. Free up your harddrive space. It is the true free program to scan and delete duplicate files from pc. You may upgrade the freeware to a professional version. The duplicate file remover pro edition can allow you to automatically delete duplicate files as many as possible at the same time. Delete Duplicate Files From Folder or Hard Drive Now ! Do you have any idea how many duplicated files are stored on your computer? You may run out of free space because there may be gigabytes of unnecessary duplicated files clogging up your machine. Especially, after you use your computer for years, when you upgraded your os system from Windows xp to vista and to Windows 7. Now you may need look into your desktop or laptop machine whether there are millions of duplicate files. You may be astonished that so many duplication files accumulated and they are wasting your hard disk space. So you will think "how to find and delete duplicate files from my computer ?" or "is there a free application to delete duplicate files in Windows 7 ?" It is time for you to find a duplicate file cleaner software tool to delete file duplicates instead of buying new storage hardware. Duplicate Filter will help you find and delete duplicate files on your local computer or computer network. Your hard disc may have many unneccessary and duplicate files. Our easy to understand program not only finds these files but it also allows you to safely delete them, thereby reclaming your disc space. Duplicate Filter provide you with the best way to delete duplicate files. Duplicate Filter will save you time and money with its unique ability to work with multiple folders and drives at the same time. You can specify as many drives or network locations to include in the search, and the program finds all the duplicates across all these locations. This frees you from having to perform repetitive searches among different locations. You can scan and delete duplicate files from folder, hard drive, or network computer's shared folders, whatever you specify. This is one of the prominent features of our program. Duplicate Filter has the flexibility to meet your needs, and it is also easy and safe to use. The comparisions are easily changed, allowing you to determine which files should bring to your attention as duplicates. It compares files byte to byte or can use the CRC, allowing you to balance between speed and precision. You can set some limited searches by file name, size, date, type, etc. You can save your frequently used searches so the next time you need to clean up your machines or network you get right to the duplicates. You can batch select lots of duplicate to be deleted at the same time, then with one click operation to permanently delete duplicated files from hard drive. After deleting duplicates from your hard drive, you will find your hard disk releases so much space again. In addition, Duplicate Filter have a powerful feature to find out the largest files on your computer, or even in each folder, then you can erase those unwanted large files to free up more disk space instantly. Duplicate Filter has unmatched simplicity, power and speed. It will save you time, effort, and money by helping you clean up your congested discs and networks. It is the best free program that deletes duplicate files on pc! Find Duplicate Photos/Images, Music files and Documents. Find duplicate files in seconds with this duplicate file finder freeware. Archive computer files more easily. With this fast duplicated file remover freeware, you can delete duplicate files from pc you don't need. Duplicate Filter is a free program to remove duplications in your computer. Find and delete duplicate files, free!. Scan each folder to find the largest files, and delete those unwanted ! Free up disk space with this free duplicating file cleaner to increase disk space. Permanent Duplicate File Deleter Freeware plus a professional edition that has more useful features. No matter you are looking for a programme to delete duplicate photos, or remove duplicate mp3 files, Duplicate Filter is a better, easier and faster dupe file finder for you to completely search and remove any unwanted duplicate files that Windows can't find and remove. With Duplicate Filter , you can easily and thoroughly wipe out any detected duplicate files on your computer and other removable devices, including duplicate mp3s, duplicate pictures, duplicate Excel file, duplicate Word files, duplicate photos and many more. Duplicate Filter enables you to search and delete any duplicates fastly and easily without any hassles. You can use Duplicate Filter to search files, photos or music on your drives or portable devices. It also provides very easy and intuitive interface for you to remove the unwanted duplicates within a few clicks. Are you intersted in Free program to delete double files? Do you want software to eliminate duplicate files? Try Duplicate Filter! It is an easy-to-use duplicate files deleter and duplicate eliminator free! Having Duplicate Filter, you will know how to delete duplicate photos and clean up dice duplicate files.